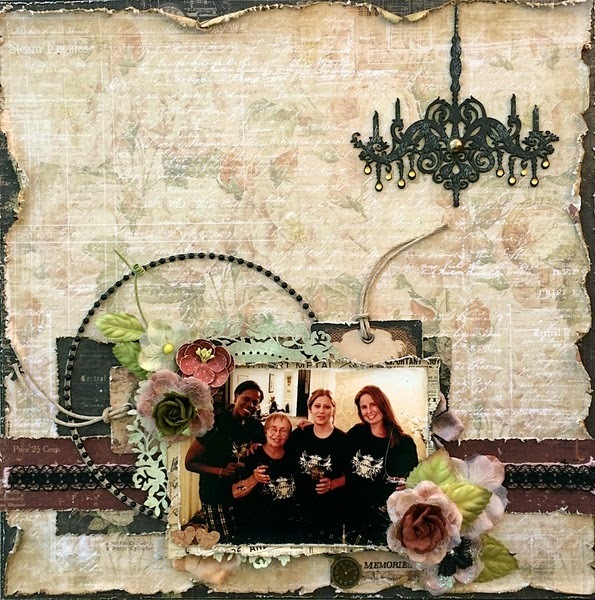 Scrapping Fancy: Swirlydoos Kit Club September Reveal! Swirlydoos Kit Club September Reveal! 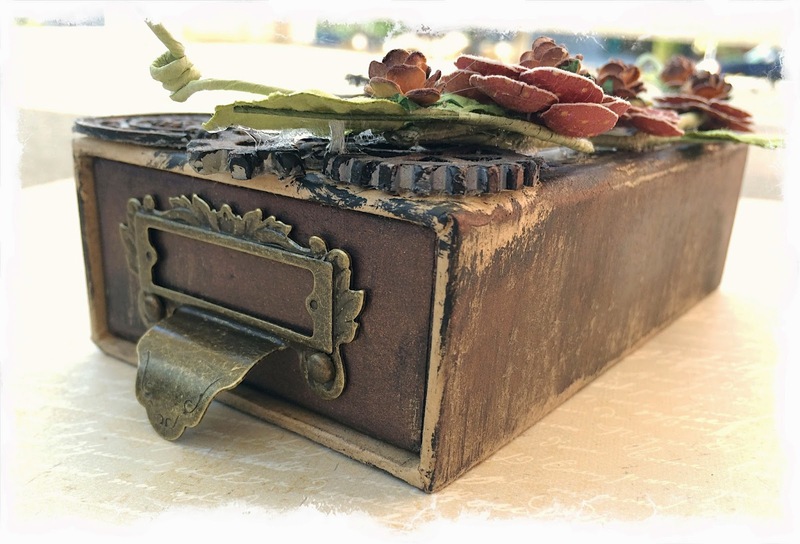 September Scrapbook Kit Reveal & Blog Hop! If you came here from Debbie's blog, then you are on the right track. If not, go back to Swirlydoos' blog and start from there. We have some amazing projects for you to see today !! Make sure to leave a comment on all of the blogs for a chance to win!!! Make sure you have LIKED & FOLLOWED Swirlydoos on Facebook!!! 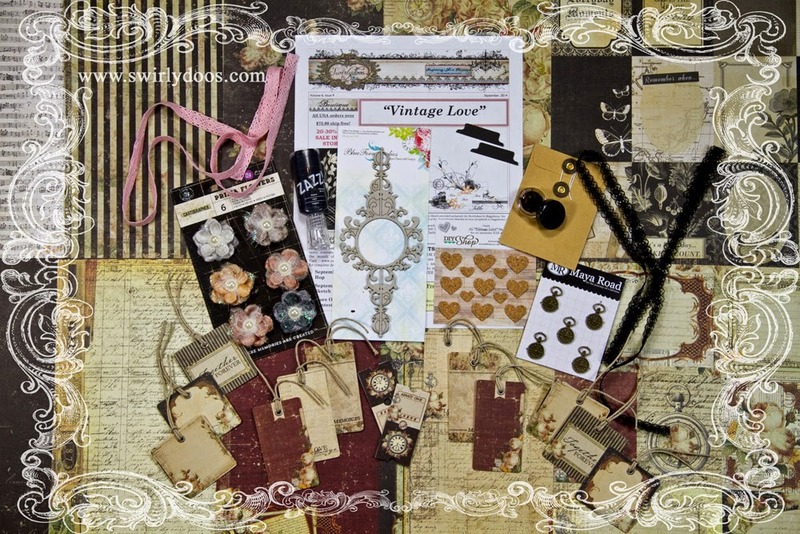 And check out these coordinating add ons that perfectly compliment our September scrapbook kit! Are you a subscriber? If so, your kit is on it's way! If not, check out the Swirlydoos store to see if there are any September kits or add ons in the store! Oh my, this collection is TO DIE FOR! I am so in love with Prima's Time Traveller collection! Here's what I've made SO FAR with this amazing September kit. This month, the the project/technique kit has an ADORABLE little box, and I knew right away that I would make it into a tiny shadowbox. The main focus of the tech kit is the metallic Mod Melts with a great mold with keys, keyholes, and GEARS! I love the gears so much. 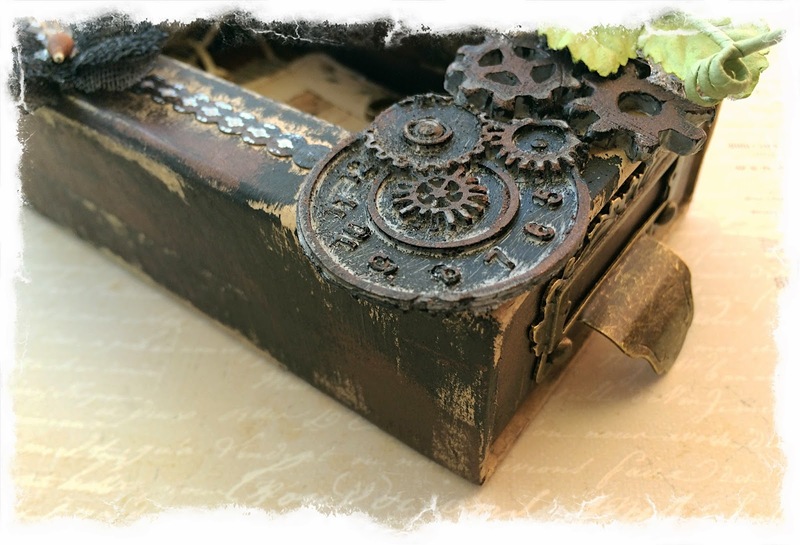 I love to buy the Tim Holtz gears, but this is really nice for making your own- you'll never run out again! I made the gears and clock out of the Mod Melts for my design at the bottom of the box- great accents. 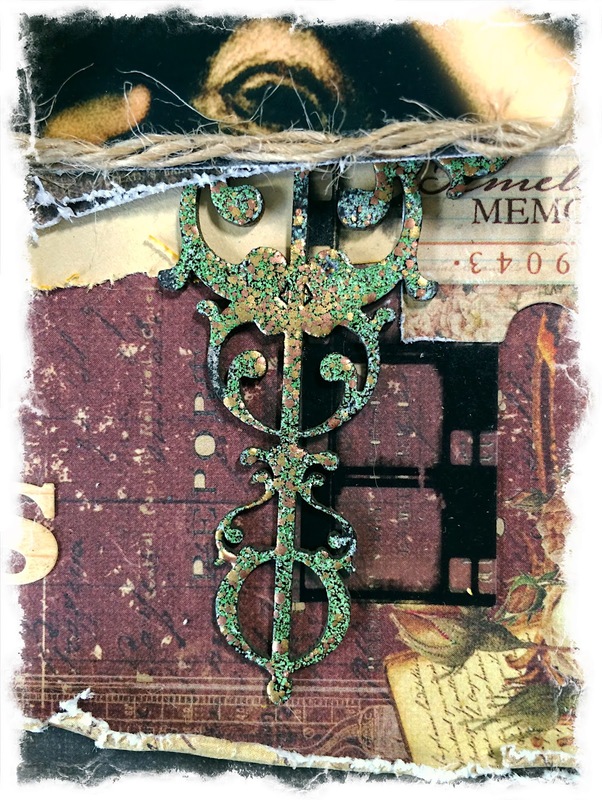 And, be sure to check back on the Swirlydoos blog on Saturday, September 20th, to see how I finished up the shadowbox, how I created this distressed finish, and the embellishing! Did you see the sketch on the Swirlydoos blog for September? Oh my- it is my favorite! This is my take on it. Look, it's the Swirlydoos chandelier! This piece came in the embellishment add on. I added this to the corner to balance the design. And, I can enter it into the Swirly Girls Challenge that Barbara is hosting on the forums! I did a basic treatment- lightly rubbing my archival ink on the chipboard, leaving some of it raw. Then I added some bling from my stash. Here's a closeup that shows the flowers and tucking of papers and embellies under the photo. I used my nesting circle dies to create the circle and then used the black pearl strands from the embellishment add on on it to create a perfect bling circle. I layered the lace and crocheted trims for added interest. The green paper is a doily from my stash. I have been waiting for the perfect kit to scrap this pic! I took this on Owen's birthday this year. It was a sweet moment, and it's one of my all-time faves of my guys! I used a notebook punch to get this edging. I cut up the Blue Fern Chipboard to make it work with my design. 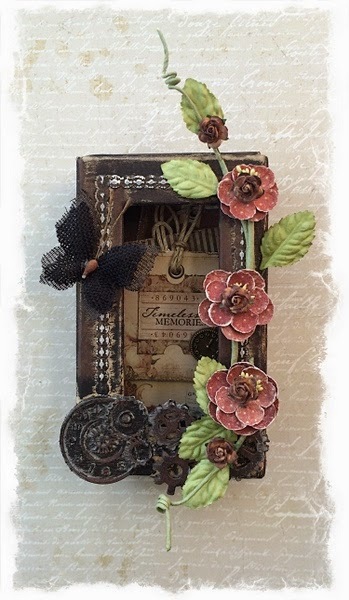 I used some Stampendous embossing powder to get this look. 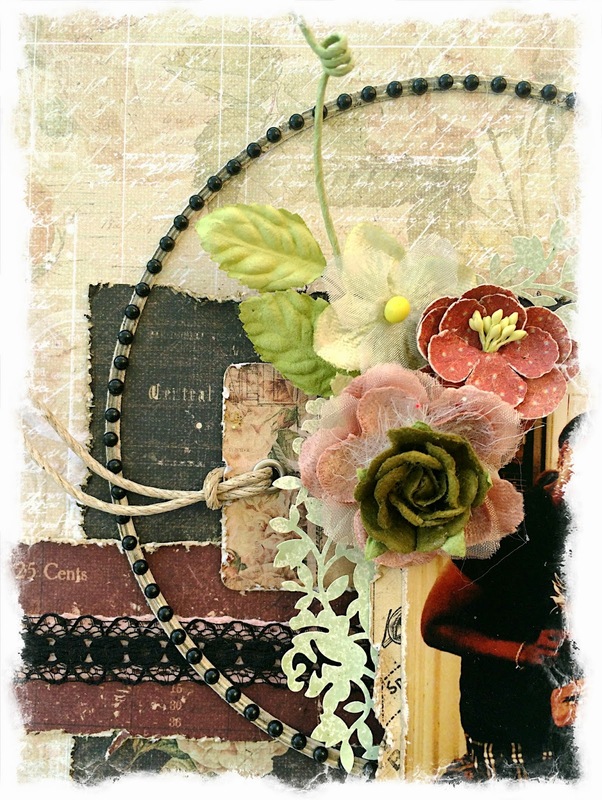 And, here's a closeup that shows how I framed the picture with Kasiercraft string from the embellishment kit. And, I added the cork hearts from the main kit. 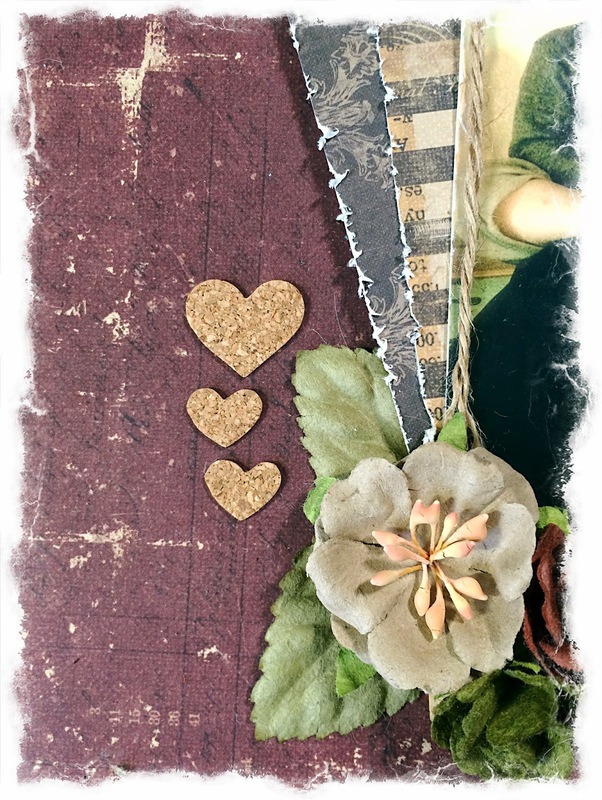 I have to say that I would have never bought these little cork hearts, but that is the joy of getting Swirlydoos kits- Krissy puts stuff in the kits that I didn't even know I wanted! I love them! Thanks for letting me share my projects with you. 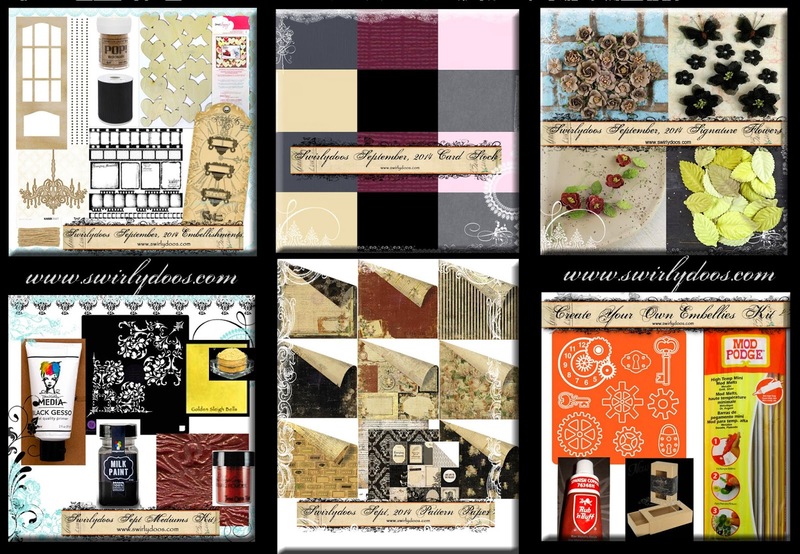 These are Design Team projects I created for Swirlydoos Scrapbook Kit Club. If you’re ready to start getting perfectly coordinated, top of the line scrapbook kits delivered to your door, please visit us at www.swirlydoos.com. Mention my name (Rae) when you subscribe and you’ll receive 10% off your first kit, AND a coupon good for 30% off your entire purchase in the Swirlydoos.com store! Make sure to leave a comment on all of the blogs for a chance to win!!! Thanks so much for joining us! Head back to the Swirlydoos blog and post the phrase in the comments. Good luck! My Gosh..... I love your awesome shadow box and the gears are perfect! I will watch the video later but they really look awesome. Your sketch page is so sooooooooo Beautiful. I simply love every little detail on it. And then.... my mouth fell open as I watched that STUNNING page of the men in your life.... that pages screams love and is so so Beautiful. Wow Rae.... and I totally mean this.... AMAZING work lady!!!!! Really love the altered matchbox. You really did an excellent job with distressing. Your guy layout is so cute. Thanks for all your inspiration each month. WOW!! love all your beautiful projects. the shaddow box is superb and the layouts are stunning. Gorgeous chippies. Love the layout of your guys in particular, but all are wonderful. Rae: Your pages are ALWAYS awesome! 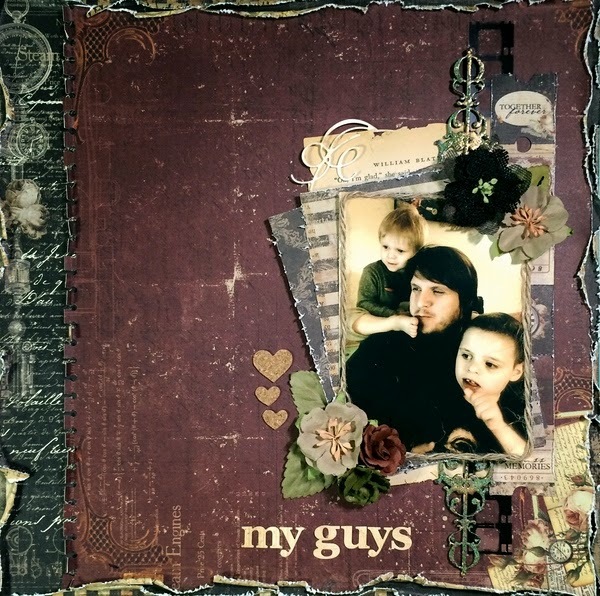 But the subject in the "guys"- now that is really awesome - hehehe. Great job on the mod melt! Knew you would! Rae so beautiful. What great layouts, I love the chandelier! Great work my friend. Gorgeous projects, Rae! That shadow box is amazing! I can't wait to dig into this kit! Gorgeous projects Rae!!! I love the shadow box.... Now I wished I ordered one. Such an Exquisite creation. Fabulous box and layouts. 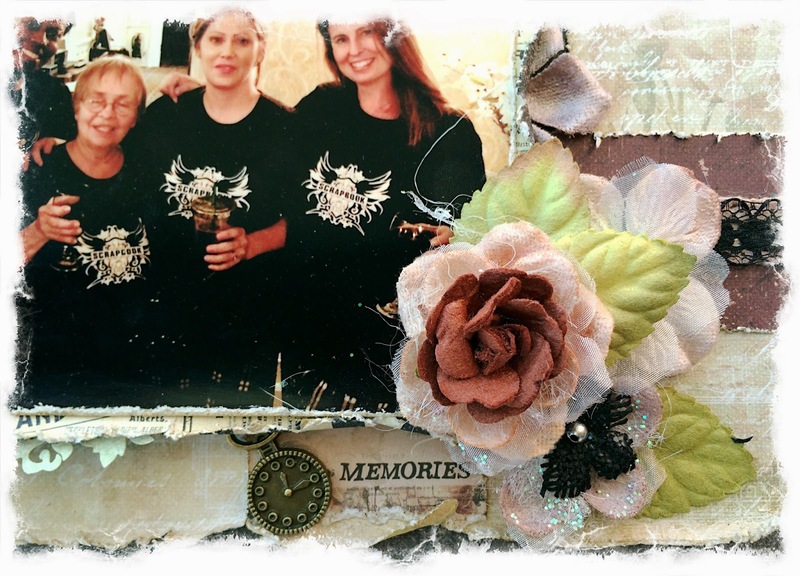 The Memories layout is magically beautiful. The chandelier embellishment stole the lime light. Loved it a lot. Such wonderful projects. The layouts are divine and the box is awesome. Thanks for the inspiration! Wow! Loved the Guys layout, it was just gorgeous, and your sketch L.o too! I was blown away by those gears, truly! Beautiful projects! thank you so much for all the wonderful inspiration! Love your shadowbox and layouts! Beautiful embellishments! The shadowbox looks like so much fun to put together... going to have to try one! you never disappoint! Awesome, awesome! awe....such a beautiful layout! 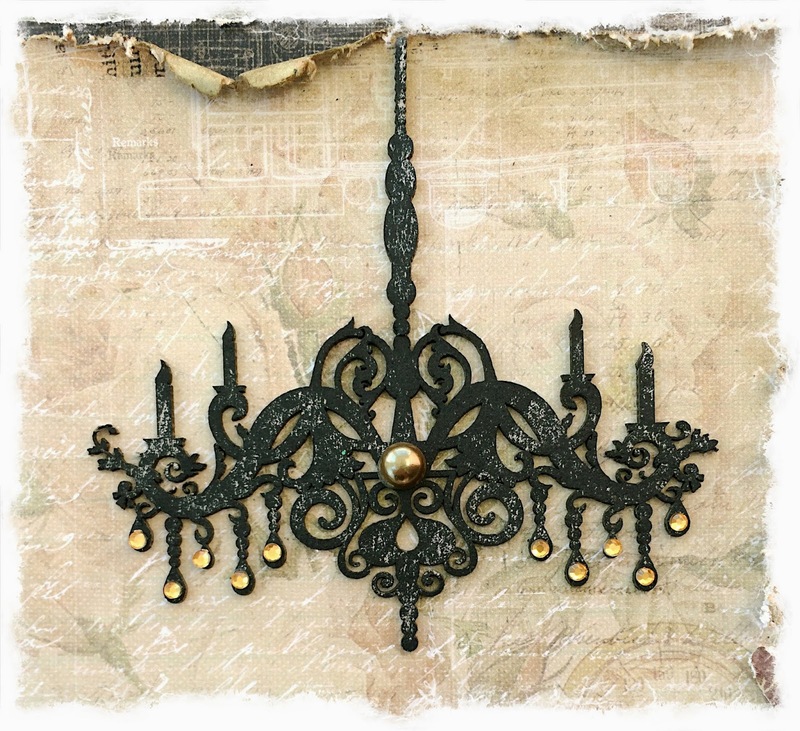 I love the shabby distressed and the coordinating embellishment on it. The wide space really enhance the focus on the photo! I love the way you come up with detail Rae! so much to look at and very unique. Great hop! Rae, these layouts are some of your best!! Absolutely gorgeous - will be scraplifting that BOYS layout!!! Dang, Rae!!!! Your matchbox is beyond WOW; I loved the first video and can't wait to see the second part of your tutorial!!!! And the layouts!!!! You captured Camp at Memories Manor perfectly with the chandelier, flower clusters, layered trims and MM doily!! The last one is my favorite, with the perfect background of papers and book page and altered chippy behind this lovely photo and the hearts going down the side!!!! wow! these are all gorgeous! 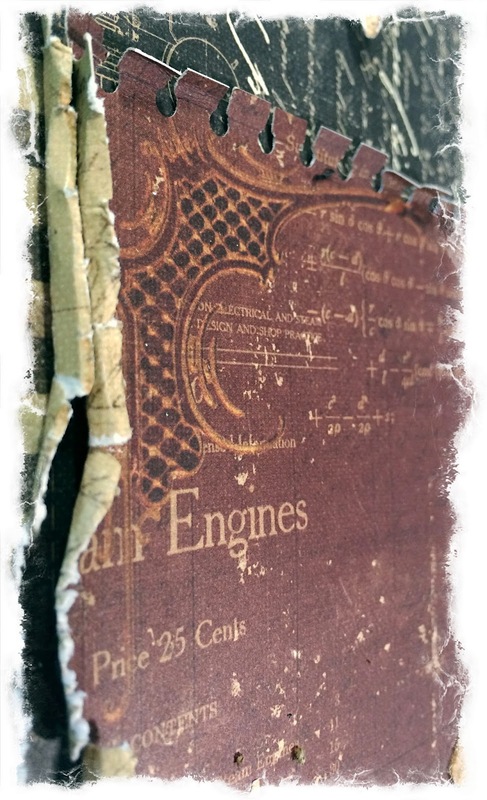 the altered matchbox is divine and the details in your layouts are inspiring! Love the string frame around your photo! Love the shadow box. Your work is amazing as always.